With incredible beaches and breathtaking mountain scenery, Corsica never ceases to amaze. With both French and Italian flavours, fantastic cuisine and a friendly atmosphere, this island will capture your heart. The unspoilt landscapes of this island will seduce you. The wonderful beaches and the drama of the mountains behind, the forests and the aroma of the maquis, all add to Corsica’s unique appeal which sets it apart from the crowded Mediterranean resorts. Ideal for families and couples alike, a holiday in Corsica offers something for everyone. Corsica is an island with a turbulent and fascinating past. Most famous as Napoleon Bonaparte's place of birth, invasion and resistance has always been a recurring theme in the island's history. 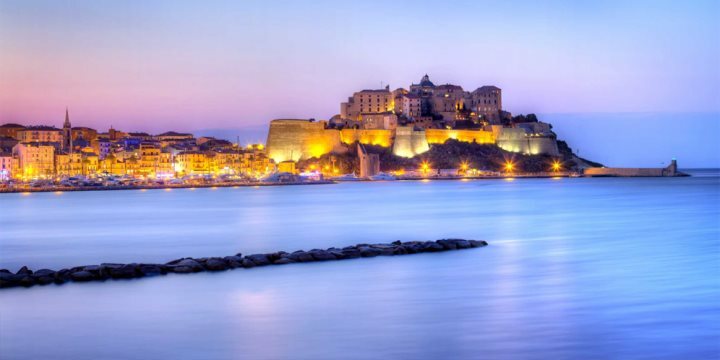 Its location has given it strategic and commercial appeal over the years and so it has always attracted the attentions of major European powers and subsequently, the battle for independence has dominated Corsica's history, character and landscape. The earliest Corsican inhabitants date from around 3000BC; they left impressive menhirs or standing stones, carved with staring faces, which can still be seen at Filitosa. Centuries later in 540BC the Greeks colonised the island, they were succeeded by the Romans and it was then that the pattern of conflict and battle began with waves of invaders and raiders to the shores. The island suffered under harsh rule by successive Mediterranean kingdoms, with Genoa gaining undisputed control from around 1500. Genoa sought French help when rebellion flared in 1729 and French troops pacified the island. The rebellion continued, however, and in 1755 the Corsican patriot Pascal Paoli was proclaimed General of the Corsican Nation. Before being forced out by the French in 1769, Paoli founded a university, and introduced a democratic constitution, with all men over 25 eligible to vote. Paoli returned in 1790 and, with British backing, declared independence from France; Nelson lost his eye at the siege of Calvi and British forces captured a number of coastal towns. Independence was short-lived though; the British withdrew in 1796, Paoli departed to live in London and Napoleon (who was born in Ajaccio) moved in his army. Corsica has been a department of France ever since. Compared with mainland France, Corsica is very sparsely populated. None of the towns on the island is large; even the capital, Ajaccio, has a population of only 55,000. Corsican families retain close links to their land, which is the main reason why the island has escaped mass exploitation despite some recent building; many people will never sell their inheritance for development. Corsicans are proud of their heritage. France is referred to as "le continent," and attempts by outsiders to make a fast buck out of the island are resented. Nationalist sentiment is rooted in a deep personal love for Corsica and is expressed, at different levels, through the teaching of Corsican language (Corsu) in schools, or through daubing FLNC (Front de la Libération Nationale de la Corse) slogans on public signs and buildings. Many Corsicans of all ages speak Corsican, a language whose history is obscure. Written, it looks rather like Italian, though it sounds different to the ear. Many names are Italian in form, with some pronounced the Italian way, some the French way. Corsican music is also resurgent; in recent years musicians have fused modern melodies with traditional vernacular songs or church chants to create an evocative, contemporary folk music. The Moors Head has become the emblem of Corsica and can be seen on flags throughout the island. Any locally produced goods, official buildings, Corsican owned boats, properties and aircraft carry this symbol and all Corsican political parties (whatever the strength of their Nationalist tendencies) also use the emblem. In some specific cases it may represent a stronger Nationalist/Autonomist leaning, but is generally a simple statement of pride in their country. The symbol dates back to the 13th century, when the Aragonese were given rights over Corsica by the Pope after their victory over the Saracens. They portrayed their acquisition by the Moor's Head. It was however, forgotten in Corsica during the subsequent Genoese occupation when the Virgin Mary (the patron Saint of Corsica) was used to symbolise Corsica. In the 18th century the German adventurer, Theodor Von Neuhof (who became king of Corsica for 6 months in 1736) chose the forgotten Moor's Head as the National flag. Twenty years later it was re-established as the official Corsican flag by the great Corsican patriot, Pasquale Paoli who insisted that the bandana was moved from its original position covering the eyes (to the forehead) in order to symbolise the liberation of Corsica.